Reader Question: My 11 yr old female JR rose from a long sleep to greet us in her typical excited greeting...jumping up and nuzzling us. Then she fell over on her side & couldn't get up for about 30 seconds. We tried to sit her up, but her legs wouldn't hold her. Then she was fine again with no sign of a problem. Only medical problem she's had was a bad bladder infection about 5 months ago after being in a kennel 4 days (she was fine when I picked her up, but next day ran 106' temp for just a few hrs before rushing her to vet & antibiotics). She's been fine ever since. We're away from home so can't get her in to her vet. We thought maybe it was just light headedness like a human. Would appreciate your ideas. 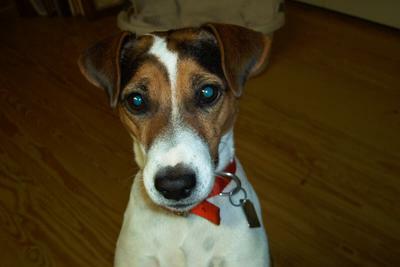 I can’t determine exactly what happened with your Jack Russell based solely on your description but one possibility is a seizure. As long as your dog appears to be perfectly normal at this point and doesn’t suffer a relapse, you should be able to wait until you get home to follow up with your veterinarian. Make an appointment upon your return and tell him or her what you saw. The doctor will perform a physical exam and probably run some basic laboratory tests (e.g., blood work and a urinalysis). If your veterinarian feels that a seizure is the most likely explanation for your dog’s episode but everything else checks out normally, he or she will could recommend taking a “wait and see” approach. In most cases, medications to control seizures are not started unless/until a pet has seizures that last for a couple of minutes or so and/or occur frequently enough (a few times a month) to become a quality of life issue.